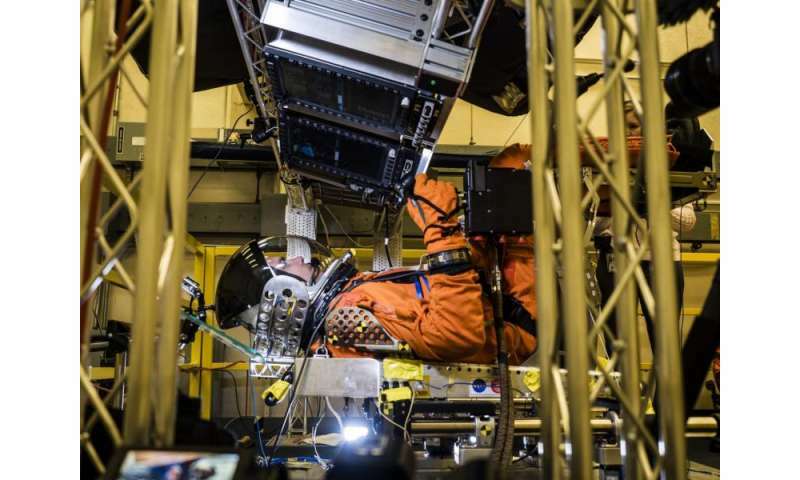 In a lab at NASA's Johnson Space Center in Houston, engineers simulated conditions that astronauts in space suits would experience when the Orion spacecraft is vibrating during launch atop the agency's powerful Space Launch System rocket on its way to deep space destinations. A series of tests occurring this month at Johnson will help human factors engineers assess how well the crew can interact with the displays and controls they will use to monitor Orion's systems and operate the spacecraft when necessary. Test subjects wore modified advanced crew escape suits that are being developed for astronauts in Orion, and sat in the latest design of the seat atop the crew impact attenuation system. This was the first time this key hardware was brought together to evaluate how launch vibrations may impact the astronaut's ability to view the displays and controls. While Orion's late 2018 mission will be uncrewed, engineers are hard at work performing all the necessary evaluations to make sure the spacecraft is ready for crewed missions beginning as early as 2021.